TONAWANDA -- Two days from now happy couples will be sharing cards, eating chocolate and dining on escargot to prove their love for one another on Valentine's Day. Meanwhile, you just wanna rock. 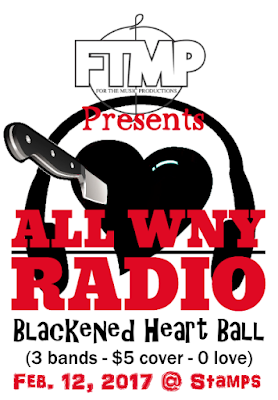 Have no fear, the All WNY Radio Blackened Heart Ball is here for you. The anti-Valentines Day show presented by For the Music Productions at Stamps features some good old-fashioned metal from Final Decline at 7 p.m., followed by punk from Scathed at 8 p.m. and finally rockabilly to end the evening by Lower Town Trio beginning at 9 p.m. Organized by All WNY Radio's (ThinkSo) Joe Kent and FTMP's Greg Burt, the show should strike a perfect balance for those who prefer their poetry in the form of great music -- without the need to buy flowers or spring for a fancy dinner. To add some intrigue to the already great lineup, Kent suggested making the gig a "second Halloween" with the bands and their fans encouraged to come in costume. We promise you won't be the only one. 3 bands - $5 - 0 love. We'll see you there.